The Rane AM2 is both an 8 channel, gain-sharing automatic mic mixer and simultaneously a Rane RAD. Use it as a standalone mic-only mixer, add more gain-shared mics using up to seven additional AM2 Automixers, and/or use the RAD Port to transport the mic mix to Rane's HAL system. The XLR Main Output can be set to mic- or line-level to feed a mic snake or a +20 dBu max balanced input. When an AM2 is used standalone, both the XLR Output and the RAD Port output audio are affected by the front panel Output Level control. When the AM2’s Cascade Output feeds a downstream Rane AM2, the front panel Output Level control only affects the XLR Output. The RAD Port sends the AM2 Output mix to a Rane HAL System. Cascade IN accepts audio and data from an upstream AM2’s Cascade OUT. 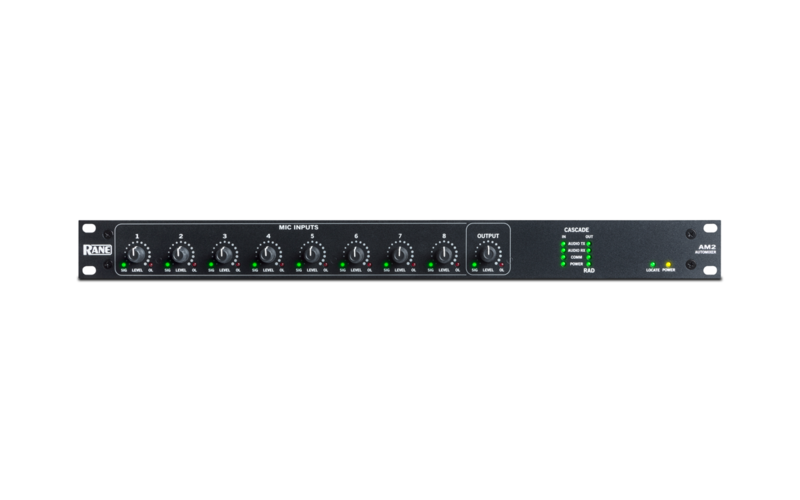 This adds eight more mic channels to the initial AM 2 creating a 16-channel gain-sharing automix. A maximum of eight AM2s can be cascaded, offering up to 64 gain-shared mics. Simply connect Cascade OUT ports to Cascade IN ports and the RAD Port to the HAL. Both the Cascade IN port and the Cascade OUT/RAD Port have status indicators to aid setup and troubleshooting. Rear panel Fault, Locate, and Power indicators inform of device errors, the AM2’s physical location and AC power status. Duplicate Locate and Power indicators on the front help installers physically locate and verify AC power to the AM2. 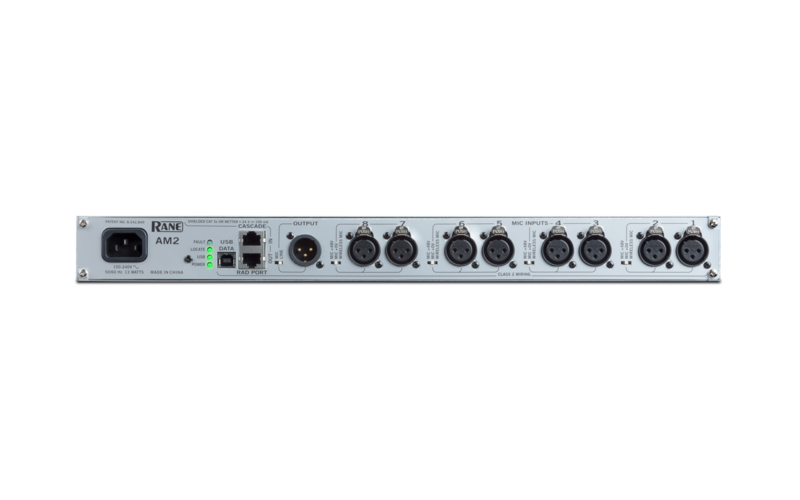 Eight XLR Inputs with Level controls & Sig/OL indicators. 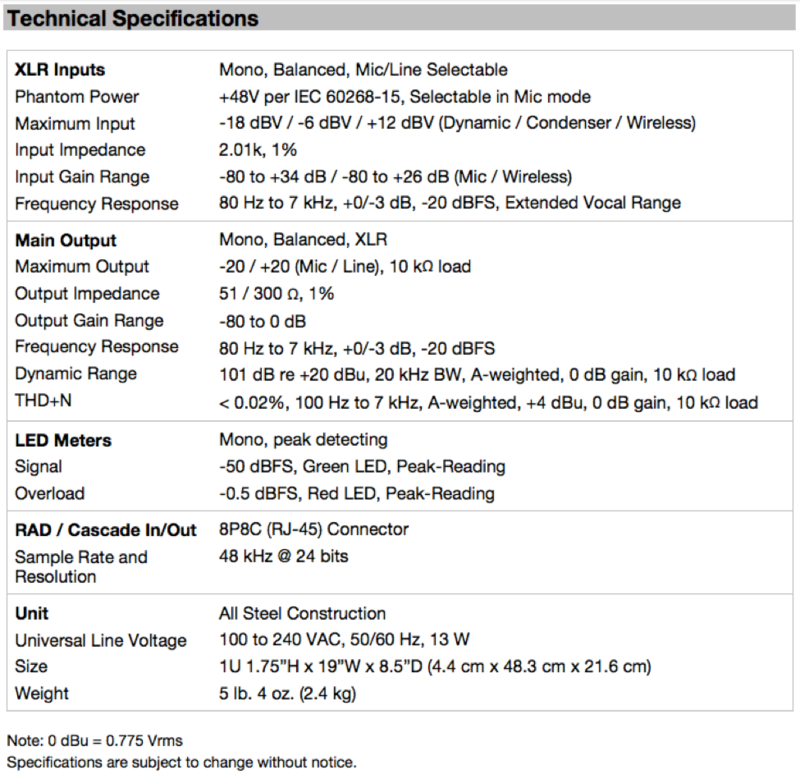 Each can be Mic, Mic with 48V phantom, or Line-level. Add up to 64 more gain-sharing inputs by cascading AM2 Automixers. XLR Main with Mic/Line switch, Level control & Sig/OL. RAD Port may send Output to HAL (DSP/control). It is possible to cascade the AM2 mix into Halogen's Gain-Sharing Auto Mixer or Room Combine Processor DSP, so that all mics connected to HAL may gain-share.